The New Yorker, Oct. 3, 2005. At the northern end of the White Sands Missile Range, in the semi-arid desert of central New Mexico, a road stretches toward the charcoal-colored rockface of the Oscura Mountains, which rise to nearly nine thousand feet. At the end of the road is a neat circular shape, about a half mile in diameter. This is the site of the first atomic explosion, which took place on July 16, 1945. When the bomb went off, it obliterated the creosote bushes that had been growing here, along with every other living thing inside the circle. When plant life returned to the spot, grass and yucca plants took the place of the creosote. The change in vegetation explains why the site is visible from miles away, and probably from space. White Sands is a mesmerizing place—an outdoor museum of mankind’s highest ambitions and deepest fears. The missile range is still an active facility. Lately, the Defense Threat Reduction Agency has been using an area nearby to study the effects of explosives on underground bunkers. One corner of White Sands is occupied by LINEAR, the Lincoln Near Earth Asteroid Research project, which scans the skies for errant asteroids, particularly those big enough to cause mass extinctions. At the same time, the range functions as an unofficial wildlife refuge, the secrecy of the place serving to protect various species. It is home to herds of oryx, an African antelope. They are noble animals with horns like medieval spikes, and they can go for extended periods without water. J. Robert Oppenheimer, the man who oversaw the building of the first atomic bombs, called the test site Trinity, in honor of John Donne’s sonnet “Batter my heart, three-person’d God.” The poem contains the words “break, blow, burn, and make me new.” Oppenheimer was made new by the explosion, or, at least, was not the same afterward. The terrain beneath the bomb—Ground Zero, it was called—also underwent a transformation, which scientists are still trying to understand. When Trinity personnel came back to inspect the site, they found a green, glassy substance covering the ground. The latest hypothesis is that this artificial mineral, which was named trinitite, formed when soil, water, and organic matter were lifted off the ground and fused in the heat of the blast. Over the years, tourists have carried away much of the trinitite in their pockets—the site is open to visitors twice a year—and most of the rest was buried beneath the soil. Looking down at the ground, you would never know that anything out of the ordinary had happened here. What happened at Trinity is the subject of “Doctor Atomic,” a new opera, with music by John Adams and a libretto by Peter Sellars. The opening scenes take place at Los Alamos, the headquarters of the Manhattan Project, two weeks before the test. The rest takes place on the night of July 15th-16th, in the hours leading up to the detonation. It will have its première at the San Francisco Opera on October 1st. Sellars—director of opera and theatre, activist, professor of “art as moral action” at U.C.L.A.—actually does talk like this. He speaks better than most writers write, moving through thickets of erudition toward exact epiphanies. His orations and incantations well up without warning, and break off with a giggle, or a profanity, or a burst of California slang. He has a compact, almost elfin body; his shoulders slope down sharply from his neck, and his feet pad the floor in short, quick steps. His hair shoots straight up, giving him the air of being perpetually electrified. He has a boyish quality, and dresses in boyish clothes. A typical ensemble may consist of cargo pants, an oversized flannel shirt, and a track jacket. Yet, when he is in the grip of one of his rhetorical tours de force, he takes on the look of an elderly sage: his head turns toward the heavens, his arms stretch upward in supplicant gestures, his face twists into an attitude of ecstatic pain. The blend of mental power and depth of feeling in one man is almost fearsome. But the most distinctive thing about him is his warmth: his customary way of greeting a stranger is to wrap him in a hug. It was the peak of the atomic season—midway between the sixtieth anniversary of Trinity, on July 16th, and the sixtieth anniversary of Hiroshima, on August 6th. Books about Oppenheimer and the bomb were being published, seemingly, at the rate of one a week. Sellars, who was in town to direct a production of Osvaldo Golijov’s “Ainadamar,” at the Santa Fe Opera, pointed out that there were traces of atomic history all around: we were sitting a few hundred feet from 109 East Palace Avenue, the studiously inconspicuous front office for Los Alamos, where Dorothy McKibbin, Oppenheimer’s gatekeeper, took in bewildered émigré physicists and sent them on the road to the laboratories, twenty-five miles to the northwest. Sellars has long been in the habit of dragging opera into dangerous places. When he was an undergraduate theatre prodigy at Harvard, in the late nineteen-seventies, he staged an abridged version of Wagner’s “Ring,” with lip-synching puppets. In the eighties, in a series of productions both notorious and revered, he placed “Don Giovanni” in Spanish Harlem, “The Marriage of Figaro” in Trump Tower, Handel’s “Julius Caesar” in Beirut. His first collaboration with John Adams was “Nixon in China,” in 1987; the title more or less explains the plot of the opera, though not its dreamlike atmosphere. His second Adams collaboration, “The Death of Klinghoffer,” ventured into the even riskier territory of Israeli-Palestinian relations and international terrorism. The librettist for both of those projects was Alice Goodman, who also was to have written the text of “Doctor Atomic.” When Goodman backed out, Sellars decided to write the libretto himself. Or, rather, he decided to assemble a libretto from extant material, because he realized that the subject resisted a conventional treatment. Rhodes was impressed to hear of Sellars’s prolonged immersion in the Los Alamos story. The libretto is an ingenious collage, stitching together declassified documents, transcripts of meetings, interviews with participants, and standard histories. Events are sometimes condensed, but almost every line can be checked against a source. The cast of characters includes Oppenheimer, in all his brilliant, arrogant, magnetic, cryptic glory; his wife, Kitty, seething against the confines of Los Alamos and losing herself in drink; Robert Wilson, an idealistic young scientist, who opposes the use of atomic bombs on Japan; General Leslie R. Groves, the oversized bulldog in charge of the entire operation; and Jack Hubbard, the Trinity meteorologist, whose predictions of thunderstorms drive Groves into an impotent rage. Lurking to the side is the Hungarian-born physicist Edward Teller, who is beginning to feel the resentment that will lead him, at the height of the Communist hysteria of the nineteen-fifties, to denounce Oppenheimer as a security risk. In Sellars’s “Doctor Atomic” libretto, as in Oe’s “A Personal Matter,” the word “Hiroshima” appears once. In the first scene of the opera, which depicts a staff meeting at Los Alamos, Oppenheimer goes through a list of potential Japanese targets with Teller and Wilson. (Some of the dialogue is taken from a Washington, D.C., meeting that occurred a few weeks earlier.) When the physicist gets to Hiroshima, the strings and brass play a soft groan of a chord, containing multiple, clashing major triads, and then the dialogue moves on. That same chord returns, in modified form, at the end of the opera. Here the advantage of opera as a dramatic medium becomes clear. The characters do not know what is coming. The orchestra, brooding from the start, knows everything. The first person to theorize nuclear weapons was the Hungarian physicist Leo Szilard, who, as Richard Rhodes relates, pictured an explosive chain reaction while crossing a London street in 1933. The first person to theorize “Doctor Atomic” was Pamela Rosenberg, who was appointed the general director of the San Francisco Opera in 1999. An administrator of sharp intellect, Rosenberg arrived with the conviction that opera should be more than an opulent entertainment. She decided that a new work by John Adams should be central to her tenure. Rosenberg has sometimes been a controversial figure in San Francisco, but her productions have had a strong impact, and few have faulted her for launching “Doctor Atomic,” which will travel to at least four opera houses over the next few years, including the Met. Rosenberg leaves next year to become the general manager of the Berlin Philharmonic. She will, as she says, go out with a bang. Adams’s ability to attract lofty epithets has aroused envy among his colleagues, but he has won his eminence fair and square: he has aimed high, he has addressed life as it is lived now, and he has found a language that makes sense to a wide audience. As a music student at Harvard, in the late nineteen-sixties, he received the gospel according to Arnold Schoenberg, who held that composers of integrity should flee the profaned temples of mass culture and cry out in a wilderness of dissonance. Adams bought into all that when he was young, and even wrote a letter to Leonard Bernstein chiding him for the tonal simplicities of “Chichester Psalms.” He then began to find his way outside academic language, investigating the chance methods of John Cage and embracing New York minimalism. Most important, perhaps, he moved to Northern California, settling eventually in a house in the hills of Berkeley. Adams and Sellars met in 1983, in the composer’s home state of New Hampshire, where they talked over the idea that became “Nixon in China.” That opera and the later Sellars-Adams collaborations (“Klinghoffer,” “I Was Looking at the Ceiling and Then I Saw the Sky,” and “El Niño”) delved into what Adams calls “psychic complexes of American consciousness — Communism, the market economy, Presidential politics, terrorism, racism.” Adams matches these sprawling themes with sprawling musical vistas, in which multiple forces are in motion. He can react to a huge variety of dramatic stimuli, and is as comfortable creating the peculiar Chinese-accented big-band jazz of “Nixon” as he is writing the hieratic Bachian chorales of the Exiled Jews and Palestinians in “Klinghoffer.” His method is often to link a character or a situation to a favorite musical gesture or texture in his memory bank; he then extrapolates from that kernel to fashion his narrative. Adams took a long break from large-scale opera after he finished “Klinghoffer.” The protracted controversy over that work, in the course of which he was called both an anti-Semite and a terrorist sympathizer, left him discouraged; he began to think that the genre was not worth the trouble. When I interviewed him five years ago, he said that he didn’t think he had another opera in him. But the Oppenheimer story proved irresistible. It offered him the psychic complex to end all psychic complexes. When Adams sat down with Sellars and looked through the sources, his eyes soon landed on some sentences in Henry DeWolf Smyth’s pamphlet “Atomic Energy for Military Purposes,” which was published just after Hiroshima: “The end of June 1945 finds us expecting from day to day to hear of the explosion of the first atomic bomb devised by man. All the problems are believed to have been solved at least well enough to make a bomb practicable.” A fast, relentless eighth-note figure—what Sellars would later call “the Stravinsky emergency music”—darted through the composer’s head. A less promising verbal cue could hardly be imagined—had the word “practicable” ever been set to music?—but Adams had found his groove. The working relationship of Adams and Sellars is intimate and complex. Each has his fiefdom, and negotiations between the two regimes are unending. Adams’s control of musical matters is absolute. He entertains suggestions from Sellars, which are sometimes very detailed—“Give me something like the Adagio of the Bruckner Fourth,” Sellars said of one passage in “Doctor Atomic”—but when Adams sits down to write, his inner voice often takes him elsewhere. The passage that was supposed to sound like Bruckner—Jack Hubbard’s final weather report, shortly before the detonation—came out sounding like, well, John Adams. When the score was finished, Sellars was puzzled that certain choice lines had been unceremoniously dropped. But he was too thrilled by the over-all result to fret. Adams, for his part, retires from the battlefield once rehearsals begin. As he watches Sellars at work, he comments on the musical execution rather than on the stage action. He may have reservations about the sheer amount of activity that Sellars sometimes unleashes onstage, but if he were to say anything Sellars would likely become all the more convinced that his instincts were right—the director is sunny and steely in equal measure. Adams is usually won over, and his gratitude is immense. The strength of the partnership lies as much in its opposing traits as in its similarities. Sellars is pure charisma, enthusiasm, happy intensity. Adams is wry, folksy, detached. Sellars is outspoken in his politics, Adams more reserved. Sellars talks about the atomic story in terms of a battle between light and darkness, although he is too intelligent to confine his characters to one side or the other. In Adams’s telling, the bomb bears down like Fate incarnate, inevitable and irrevocable. Sellars sees unexpected grace and hope blossoming around the explosion; his motto for this opera is Muriel Rukeyser’s line “Love must imagine the world.” Adams, too, supplies moments of dizzying beauty, but in the end he has written a three-hour symphony of dread. It would be a stretch to compare the staging of “Doctor Atomic” to the Manhattan Project, but the undertaking is gigantic all the same. Under the troika of Adams, Sellars, and Rosenberg, a miniature city has been working to bring the opera to life. Some five hundred people are contributing to one or another aspect of the production. Only in the final week do all the components—singers, chorus, orchestra, costumes, scenery, lighting, and the rest—come together onstage; before that, most component are prepared separately. This being a Sellars show, there are extra complications. Lucinda Childs has been devising fluid, geometric choreography for a squad of dancers. At the core of the production team are three people who have worked with Sellars since the nineteen- eighties: Adrianne Lobel, the set designer; Dunya Ramicova, the costume designer; and James F. Ingalls, the lighting designer. They have devised an overarching color scheme for the show. Graphite represents the will to kill; “true blues” represent whatever remains of the human impulse; gray and ochre tones represent the muddled middle. The colors were inspired in part by a photograph of the mountains and sky at Trinity on the eve of the test. The San Francisco Opera costume shop is in a cavernous three-story building on Ninth Street. Twenty-eight stitchers, drapers, and tailors are running up period garb for the singers, chorus, supernumeraries, and dancers. The supervisor for “Atomic” is Jai Alltizer, a soft-spoken art punk with a red-and-purple Mohawk and a long goatee. He has spent the past year trying to reconstruct the way people at Los Alamos dressed, and to master such arcana as the project’s system of I.D. buttons, which were coded white, blue, or red to identify levels of clearance, and of temporary passes—“to let you come to the after-party,” Alltizer joked. He showed me Teller’s suits (graphite), Kitty Oppenheimer’s dress (a watery-blue silk number, made from leftover Valentino fabric), and Oppenheimer’s hat—a rakish porkpie, which was famous enough in its day to be pictured on the cover of Physics Today with no caption. It is being stretched and distressed to simulate the effect of conditions on the mesa. The scene shop is in the Potrero Hill neighborhood, in an old steelyard warehouse. Last November, Jay Kotcher, the head scenic artist, and Jack Kostelnik, the foreman of the construction crew, worked with eight carpenters, four scenic artists, and a sculptor, building the scenery for the show: the huts and fences of Los Alamos; the tower at Trinity, on which the bomb was placed; an enormous protective container called Jumbo, which was never used; and the hundred-and-two-foot-wide sloping floor on which the action takes place. And, of course, Kotcher and Kostelnik built the bomb itself. For the frame, they used wood; for the shell, Styrofoam; for the skin, fibreglass. Lobel asked them to paint it a dull silver color, to give it a suitably ominous sheen. Kostelnik called up a spreadsheet on his computer to check how much the entire thing had cost. The original Gadget, as it was called, consumed hundreds of millions of dollars. The Kotcher-Kostelnik Gadget came in at $30,164, including parts and labor. It had been moved to the backstage area of the opera house, where it sat under a transparent plastic tarp, glowering at passersby. In a rehearsal space one block from the opera house, Sellars was working with a group of singers in a piano rehearsal. Adelle Eslinger, one of the music coaches, was at the keyboard, trying to summon up the sound of a hundred-piece Adamsian orchestra. Donato Cabrera, the assistant conductor, gave the singers their cues and sang the part of the chorus or vocalized a significant instrumental solo. Props were scattered around the room, to give the singers inspiration. There was a blackboard with a daunting equation written on it: 2 + 2 = x squared + 2 to the x (3π√CO) / 10 cubed. Sellars and the singers amused themselves by scrawling new equations each day. The session focussed on Act I, Scene 1, in which Oppenheimer, Teller, and Wilson debate the wisdom of deploying the bomb in Japan. The dialogue begins with a line adapted from Teller’s memoirs: “First of all, let me say that I have no hope of clearing my conscience. The things we are working on are so terrible that no amount of protesting or fiddling with politics will save our souls.” In Adams’s setting of the words, the melody moves along in shadowy, groping fashion, the notes drawn generally from the whole-tone scale. The man singing Oppenheimer is Gerald Finley, a forty-five-year-old Canadian with a firm jaw and a hypnotically expressive baritone voice. In the past few years, he has scored international triumphs in such mainstream roles as Don Giovanni and Figaro. He has also worked steadily in the less glamorous realm of contemporary opera, and seems happiest when taking on thorny, elusive characters. In the “Atomic” rehearsals, he was tireless in his pursuit of nuances, and often could be seen in the corner, puffing on a fake cigarette—Oppenheimer’s chain-smoking is a leitmotif of the opera—and trying out different readings of a line. Like almost everyone involved in the production, he had become an enthusiast of the atomic literature, and, naturally, he had thought harder than most about the central character. Teller was being sung by Joshua Bloom, a young Australian baritone. He was one of a group of cover singers who were attending all the rehearsals, studying the principals’ every move in the slender hope that they might be called to do the same onstage. Today, Bloom was happy to be standing in for Richard Paul Fink, who had been assigned the role at the last minute and was not yet in town. Bloom sang his opening line elegantly, with perfect accuracy of pitch. Sellars stopped him, seeking more. Finley ran through the Baudelaire lines in a lighter, airier tone. The words “visiting card” fluttered in the air, and the singer accentuated them by wiggling his fingers. Later in the scene, Robert Wilson registers his objections to using the bomb in combat. The part is played by Tom Randle, who is the sort of singer that Sellars loves—alert to psychological detail, physically agile, extremely well prepared. (He often mouthed the words to other singers’ parts.) Sellars urged him to invest his words with humanitarian passion and patriotic fervor. “What I always hate are right-wingers who say that progressives can’t be patriotic,” he said. Wilson’s argument, in brief, is that the Japanese should be given more time to surrender, and if the bomb is to be used it should be dropped on an uninhabited area, as a demonstration. The following day, Sellars rehearsed this same Act I scene on the main stage of the house. He was in his element, hollering instructions and channelling history as the dancers swirled around him, supernumeraries carried boxes of explosives, the women of the chorus sang an ode to the plutonium core, and the male principals ran through their chamber play of protest and intellectual seduction. The composer was there, too, though you had to go to the back of the hall to find him. Adams began “Doctor Atomic” in November, 2003, and finished it on May 24th of this year. He worked at a steady pace, hitting relatively few major obstacles as he went along. He composed directly onto thirty-six-staff orchestral music paper, without making an initial piano sketch. It’s a bit like painting directly onto canvas without first pencilling in a drawing underneath. Although Adams solved some musical problems on the computer, using various forms of compositional software, he wrote out the score the old-fashioned way, by hand. The manuscript is a mammoth thing, taking up five hundred and forty-eight pages. It sits now in his studio in Berkeley, divided into manila envelopes. For Adams, the tensest day of the process was the first orchestral rehearsal. It took place in a long, low-ceilinged hall on the grounds of the Presidio; Adams noted the appropriateness of first hearing the orchestral music of “Doctor Atomic” on a decommissioned military base. The composer walked in, saw an array of twenty gongs, and said, “My God, what have I done?” He greeted various players, some of whom he had known since the seventies, when he was a hippie-ish instructor at the San Francisco Conservatory. He went over to a table at the front of the orchestra and sat down next to Sellars, who was studying the music. Several times during the first rehearsals, Runnicles invited Adams and Sellars to talk to the musicians. This was an unusual move. Orchestral players like to concentrate on the technical nuts and bolts—Should it be soft or loud? When does the crescendo start?—and they tend to snicker at airy generalities about what the music means. So it was a bit brave of Sellars to stand up and chant Baudelaire. He then unleashed one of his verbal reveries, giving the players the same sort of Stanislavskian motivation that he had offered to the singers. Whether these instructions made any difference was not immediately apparent, but, during the break, several players came up to Sellars to thank him. Then it was back to business as usual: adjusting balances, establishing crisp entrances, making sure that a fast figure was relayed cleanly from one section to another. The orchestra was mastering Adams’s tricky textures, but, as the afternoon went on, their energy waned. By the time they arrived at the climax of Act I, Oppenheimer’s recitation of “Batter my heart,” they were tired out. Adams, who, a little earlier, had been rocking delightedly in his seat, was now bent over his score with a tight expression, scribbling notes on a yellow pad. He decided, at one point, that it was too much to ask the double basses to play some high, spidery figures in unison, so he gave the passage to a single bass player. “Doctor Atomic” begins not with music but with noise: a two-minute electronic collage of industrial groans and screeches, into which is mixed the roar of airplanes, military voices, and a snippet of Jo Stafford singing “The Things We Did Last Summer.” It suggests the buzzing of the innards of the bomb as it bleeds through radio static. All this will rain down on the audience from speakers that the sound designer, Mark Grey, has installed all over the War Memorial Opera House. Jo Stafford’s voice breaks up, cuts off, and gives way to a brutally dissonant passage for full orchestra, which feels like a detonation in progress. Adams had in mind not so much the explosion itself as the mental conflict of the Los Alamos physicists, who were mortally afraid of what would happen if their bomb did not work and no less afraid of what might happen if it did. Adams says that he was inspired in part by Edgard Varèse, who composed some of the most earsplitting music of the early modernist period. A recording of Varèse’s work “Ionisation” apparently entertained some physicists in the Manhattan Project. But the real model is one of Adams’s classic early works, his hyper-Romantic symphonic poem “Harmonielehre.” The trombone and tuba have an identical floor-rattling figure (a rising minor ninth) in both works. What had been darkly exuberant is now exuberantly dark. The chorus barges in with its report on the progress of atomic research. The manic, scurrying pattern underneath—the Stravinsky emergency music—indeed takes off from Stravinsky’s Symphony in Three Movements, which was itself inspired by the images and sounds of the Second World War: newsreels of goose-stepping German soldiers, of “scorched earth” tactics in China, of Allied forces on the march. The great Russian exile began writing it in the spring of 1942, around the time Oppenheimer was organizing a team of Berkeley physicists to work on the bomb, and finished it on August 7, 1945. Listening to Adams’s music, I pictured Stravinsky in a hut at Los Alamos, working away on an intricate problem of seemingly tangential yet ultimately crucial significance. A little later, a kind of explosive fusion occurs: the two main elements of the opening section, the dissonant chords and the driving lines, are rammed together. Throughout the scene, there are premonitions of the detonation to come. The word “Hiroshima” is uttered, with its accompanying low-brass moan. When Oppenheimer rhapsodically describes the “brilliant luminescence” of the explosion, the winds swirl like particles in rapid motion and the strings play shivery tremolo chords. Many of these sounds are familiar from the forbidding archives of modern music past, not to mention a hundred sci-fi movies. There’s a sense in “Doctor Atomic” that Adams is mobilizing the entire ghoulish army of twentieth-century styles. In the second scene comes another shock, this one of beauty. We are in the Oppenheimers’ bedroom, in the middle of the night. The physicist is sitting up in bed. Kitty wakes up and sings a setting of Rukeyser’s “Three Sides of a Coin”: “Am I in your light? No, go on reading.” The poem is used to conjure up Kitty’s sardonic, plaintive, and finally angry attempts to command the attention of a husband whose mind is buried in the mysteries of the atom. Oppenheimer, after putting aside his work, answers her with the Baudelaire prose poem that begins “Long let me inhale, deeply, the odor of your hair”—the “opium bath,” as Adams calls it. They can relate to each other only in these precious terms. Kitty acknowledges as much when she moves on to another Rukeyser poem, beginning “The motive of it all was loneliness”: it suggests that the Oppenheimers are together less out of love than out of fear. The interaction is edgy and charged, but Adams allows his music to become ravishingly sensuous. On close inspection, those blaring dissonances turn out to be simple chords nested together. They detach, breathe, sing out. The Baudelaire suggested to Adams a very French sound—surging, shimmering textures out of Debussy. It’s a drugged, drunken beauty, not quite real. In the final scene of Act I, the action moves to Trinity, on the eve of the test. A violent storm breaks over the desert. General Groves, who is played by Eric Owens, bellows, in a Lear-like tantrum, “What the hell is wrong with the weather?” Later on, after much sound and fury surrounding the arrival, raising, and arming of the bomb, Groves drops his bluster and begins to talk about his various attempts to lose weight. The oddly haunting tone of this “diet aria” illustrates what I think of as the Gadget Effect: even the most mundane chatter takes on spooky significance in light of the bomb. The crux of the opera arrives: Oppenheimer, alone at the bottom of the tower, sings “Batter my heart, three person’d God.” The most telling lines may be the last: “for I / Except you enthrall me, never shall be free, / Nor ever chaste, except you ravish me.” The aria is in the key of D minor, in the manner of a Renaissance lament, with a hint of synagogue chant; Oppenheimer sings a grand, doleful, nobly stammering melody, while the orchestra mimics the sound of viols and lutes. The private world of the opera—the world of poetry and prayer—seeps into the “official” world of lingo and debate. The action cuts between Trinity, where Oppenheimer and the rest take bets on the kiloton yield, and Los Alamos, where Kitty is staying up all night with her maid, Pasqualita. The Rukeyser poems and Pasqualita’s Tewa song become a constant, nagging presence amid the solemn jibber-jabber of the countdown. Sellars wanted to break up this mostly male melodrama by having women infiltrate the scene. Adams, for his part, keeps interrupting the general death march in the orchestra with passages of aching simplicity. You would never expect to find so much delicate writing for harp and celesta, or so many plaintive solos for horn and trumpet, in a work on this subject. So why do you remain tense as you listen? Because the other shoe must drop. fighting with flame, stand fighting in their graves. the stone deep in the mountain, the drop in the green wave. Lit by their energies, secretly, all things shine. Nothing can black that glow of life. Some of Rukeyser’s work is dense to the point of impenetrability, and some of it is tendentious, as Communist-inflected literature of the nineteen-thirties and forties often could be. Much of it, however, is breathtaking, and “Easter Eve 1945” is a masterpiece. It takes on an added power in the context of “Doctor Atomic”: those images of luminous death play almost like a prophetic vision, as if Kitty, lost in her cups, were seeing the blinding flash to come. The role of Kitty was to have been sung by Lorraine Hunt Lieberson. When that matchless artist withdrew for medical reasons, early in the summer, Kristine Jepson, an Iowa-born mezzo-soprano of rising reputation, gamely stepped in. Jepson is about as far from Kitty in temperament as can be imagined—ebullient, easygoing, self-effacing. But she soon found the sympathetic side of her character, who is, on the one hand, a neurotic, drunken mess and, on the other, the chief truthteller and moral compass of the opera. “She speaks only in poetry a hundred per cent of the time,” Jepson told me, a few hours before her first rehearsal in costume. “She’s having a vision of the mountains being on fire, she feels that she’s hearing the cries of the children. All of those—if you want to call them—hallucinations are very real to her.” And the bomb turns her hallucinations into reality. How to depict the detonation puzzled Adams from the start. He talked about the problem one day as we drove across the San Francisco Bay Bridge, on the way to a rehearsal. He knew better than to put a mushroom cloud onstage. “I can’t compete with George Lucas,” he told me. 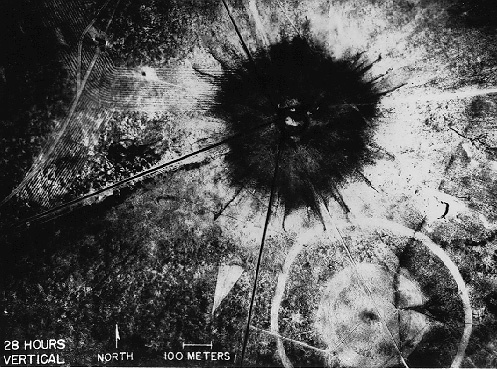 What he decided to do, in the end, was to visualize the explosion from afar—from the perspective not of the scientists in their bunkers but of the women back at Los Alamos. He sent a query to Richard Rhodes, asking whether the blast would have perceptible from two hundred miles away. Rhodes told him that “people would have noticed a dawn coming from the entirely wrong direction.” So Adams wrote a slow crescendo for trilling strings, to which is added a flash of winds and brass—a chord that dazzles and fades, like a false dawn. Once Adams was done, though, he admitted that the Faust metaphor still interested him, as long as it was not taken too literally. It helps to expose the blinkered mentality of the scientists, and particularly of Oppenheimer, who assumed that science had every right to discover whatever lay within its grasp, and that it was someone else’s job to figure out the moral consequences. Oppenheimer once had this to say: “It is my judgment in these things that when you see something that is technically sweet, you go ahead and do it and you argue about what to do about it only after you have had your technical success.” As he read the literature, Adams seesawed between an intense admiration for Oppenheimer and an equally intense dislike of him. The physicist had a violent streak, and it is unsettling to read of his more bloodthirsty initiatives—for example, his notion, floated briefly during the war, that Germans could be killed en masse by radiation poisoning. Such a program would be worth pursuing, Oppenheimer said, if it could yield the death of five hundred thousand or more people. Oppenheimer liked to float above the rest of humanity, not just intellectually but geographically. If you go to see the places where he lived, you notice that he made a habit of perching like an eagle on the rim of the world. When he lived in Berkeley, he took a house high in the hills; it had the address No. 1, Eagle Hill. In New Mexico, he had a cabin on Grass Mountain, a surreally lush meadow at nearly ten thousand feet. He was instrumental in placing the Manhattan Project atop the Los Alamos mesa. In his youth, he said that his two great loves were physics and New Mexico, and that he wished he could unite them. And he did, but only at the price of ruining, for his own purposes, the landscapes that he loved. It’s said that he felt the mushroom cloud hanging over the Sangre de Cristo Mountains, where his cabin was. One tremendous passage in Adams’s opera is an interlude called “Rain Over the Sangre de Cristo Mountains”: it is nothing more than a tremulous chain of chords, one blurring into the next. I think of it as a radioactive cloud bearing down on Oppenheimer’s aerie. A few months before his death, as cancer was spreading from his throat through his body, Oppenheimer went to hear the world première of Stravinsky’s Requiem Canticles. The same work was played at his memorial service, in February, 1967. It is no accident that the “chords of death” that end Stravinsky’s valedictory composition— a tolling of spectral bells—are echoed in the chords that end “Doctor Atomic.” There are nineteen of them, and the high gongs create strange resonances in the upper frequencies. Previously, during the countdown, time slowed to a surreal crawl, but now it seems to be racing forward, to the moment of Oppenheimer’s death. It is also moving to a nearer destination, to the Ground Zero of August 6, 1945. How Adams succeeds in transmuting Trinity into Hiroshima is not something that should be revealed in advance, for it is the most dramatic turn of the entire opera, albeit one that takes place at low volume. It has happened, and it is about to happen again. Sellars went through the poem with Finley word by word, working out gestures and facial expressions. The singer got to the line “That supreme life which I now know and which I am tasting minute by minute.” Sellars, uncharacteristically, made no comment. Finley asked, “Do you want anything special on ‘tasting’?” Sellars responded, “Oh, God, yes.” The passage ends, “Time has disappeared; it is Eternity that reigns now!” Oppenheimer, at this late stage, seems far gone, lost in the desert of his mind. Maddalena stood all the way upstage. He is a longtime Sellars collaborator, and has given many piercing performances in the title role of “Nixon in China.” In that opera, he played the troubled soul; here he plays an ordinary man who tries to keep his bearings. Sellars asked Maddalena to deliver his final weather report in a state of wonder, as if he were describing not the sky above but a paradise beyond it. As Sellars recited and meandered about, Maddalena walked right behind him, matching his gestures like a shadow. To Beth Clayton, Sellars gave the task of purifying and blessing the terrain; by the end, Pasqualita becomes a dream figure, perhaps a representative of the ancient Tewa people who once occupied the Los Alamos mesa. Sellars’s vision for the very end was not yet complete. He talked of having all the performers lie face down, arms behind their heads, as waves of light poured across the stage.